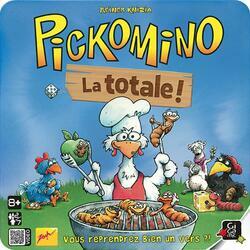 Pickomino, the basic game and its expansion. Roll out the 8 specials to pick the best pickominos or steal them from your opponents. But be careful with the expansion of new pickominos and characters get involved: the mother hen protects your pickominos, the weasel can raise the dice ... Not to mention, the worm, the raven or even the dice in gold ! Who will collect the most worms?